Shona Jackson is the author of Creole Indigeneity, an investigation of how colonial descendants of colonial Guyana, collectively called Creoles, have remade themselves as Guyana’s new natives, displacing indigenous peoples in the Caribbean through an extension of colonial attitudes and policies. Here, Jackson reveals her personal connection to the content. Guyana, where Jackson was born. This book springs from two disavowals and a sense of deep longing. The first disavowal occurred growing up in Guyana where I was born. Many Guyanese, collectively Creoles, are mixed but we are taught to assert our black or Indian (descended) identity to the exclusion of its composite parts—so I was raised to see my self as black despite the obvious Indian and Amerindian (native) ancestry in our family. The second disavowal occurred after I left Guyana at the age of seven. In my first diaspora home, the U.S. Virgin Islands, identity was articulated in terms of its exclusion and difference from other Caribbean identities, especially those not yoked to U.S. political economy. When I arrived in the continental U.S. in 1989, I realized that although Guyana had taught me to see myself as black, the term African American did not include this child of the Americas. Black identity in the U.S. was asserted in terms of an African past and not in terms of its cultural multiplicity and connectedness, for example, to Caribbean and Native cultures. Additionally, blackness in the United States has been constructed in large part against whiteness, while in the contemporary Caribbean it was understood in terms of its difference from later arrivants and links to other black cultures. By age 15 I had lived on two continents and two islands and was at home neither in the Caribbean diaspora nor in the black diaspora. So few people even knew about Guyana, much less that it is a mainland country included in the Caribbean/West Indies because of its culture and history, which significantly repeats but substantially differs from those more well-known archipelagic ones such as Jamaica. And those who knew enough not to mishear “Ghana” knew nothing more than Jim Jones, El Dorado, and, the most confidently discharged response from a professor at George Mason (where I was an adjunct): “Yes, there is a species of frogs there that they lick.” I am afraid of frogs. Jackson's family home in Guyana. Multiethnic, multi-religious, creative, brilliant, and impoverished, where the riot of nature threatens every slab of concrete laid down against it, the Guyana I knew seemed in the United States subject to an unrelenting fiction and one that could not grant me true belonging anywhere in the world. These disavowals and fictions of identity led me to question how we as blacks, primarily in the Caribbean, come to belong: how we in other words become indigenous and why and how certain exclusions or limits become essential to this process. It led to a rethinking of indigeneity not from the perspective of native status, but from that of the techniques of settler power and how they inform the modes of belonging of those involuntarily brought to the new world, specifically enslaved and indentured peoples. 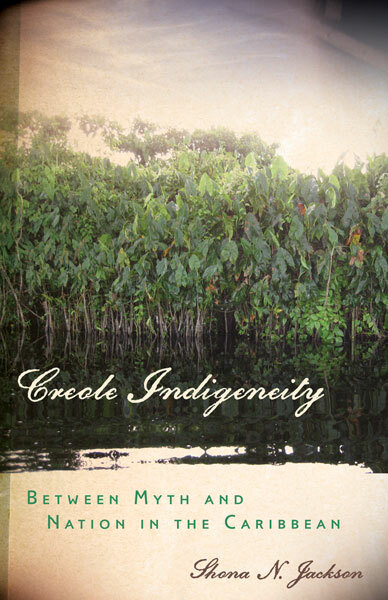 “Creole indigeneity” is the term I use to capture these modes of belonging of subalterns that refashion settler power. In the book, I demonstrate how this occurs across political, historical and literary narrative to produce a new social structure and “grammar” of being that can support and reinscribe the post-contact grammars of subaltern settlers whose mode of becoming rests now not on the time of prior origin but on the time of their labor, deeply embedded within modernity. Creole Indigeneity rethinks Enlightenment humanism, as it is adapted by subalterns for their own ontological and political sovereignty. It also achieves a rethinking of the project of postcolonial nationalism in the Caribbean as a nativizing project to institute that new “man,” or in the words of the late Guyanese president Forbes Burnham the “real man,” of the postcolonial humanist project and its inscription of labor as the new time of belonging for non-indigenous arrivants. In this dual critique, the book looks at how blacks and Indians reproduce or rewrite the labor of the formerly enslaved and indentured and utilize it as a legitimating narrative for nation building, belonging, and social being. The book therefore includes two chapters on political discourse that center on Forbes Burnham and Cheddi Jagan. It also engages the Calibanesque literary tradition, which is the site of constant articulation of this belonging in and through labor. It is in this tradition that the grammar of native being for blacks and Indians is articulated and the subaltern subject becomes the sovereign subject within western modernity. Not only have we reached the productive limit of the Caliban tradition which reproduces the conditions for bourgeois humanism—conquest, native displacement, and modern labor—but it leads to a misreading of indigenous writing because it is always viewed through the epistemological strategies of labor. The most difficult part of this work has been confronting the way in which the reworking of indigeneity for Creole being has and continues to require the subordination and displacement of indigenous peoples in the Caribbean. In Guyanese society and politics, they are marginalized by every successive administration. Moreover, while they did not provide labor for the Caribbean Plantation to the extent of blacks and Indians, they are brought into the regime of labor of our discourse and forced to continue to work for creole being, where they serve as the limit of Creole humanity. The displacement of the region’s aboriginal peoples both in cultural discourse and in political economy has become essential for Creole being and sovereignty. Shona Jackson is author of Creole Indigeneity: Between Myth and Nation in the Caribbean and associate professor of English at Texas A&M University. "Shona Jackson’s Creole Indigeneity breaks open a long-standing conundrum on the relationship between diasporan blacks and the modes of indigeneity with which they are both intersected with and/or located as oppositional to by dominant discourses in the West. Simply put, it is must-reading for all scholars of blackness and the African Diaspora because she does indeed ‘illuminate those interwoven histories beneath the surface’ that inform our broad and deeply complex ancestries." This content also appears on the First Peoples: New Directions in Indigenous Studies blog.